very addicting drama with a good plot. the ending is not so obvious and the casting is pretty good too. Kind at heart, San-jae is the son of Lee Yong-jun and Jang Myong-ja. Faced with Min-chul's hostility since young, he attempts to bridge their differences, however, his affections for Yeon-soo further widen their relationship. With a deep passion for music, he explores his talent under a pseudonym, Zero. The realisation of Yong-jun’s actual death and his actual birthright corners him into a dilemma. Hostile and rebellious, Min-ji is estranged from her father because of his marriage to Myong-ja. Her only solace is Min-chul, whom she adores and respects. She deems Yeon-soo's presence as an intrusion and Yeon-soo’s affection for her brother rakes her jealousy. However, Yeon-soo’s patience and sincerity tugs at her heart and she embraces their friendship whole-heartedly. Sung-chun’s scandal forces her to mature rapidly and she abandons her rebellious nature. Kind-hearted and submissive, Myong-ja is a victim of circumstances. For the sake of her son, San-jae, she agrees to marry Sung-chun after her husband's death, which incurs the wrath of his children. When Min-chul finally realises the truth, his amiability warms her and she looks forward to better days ; unfortunately, the truth of Yong-jun’s death crumbles her, guilt-stricken, she turns to suicide. A famous singer in her heyday, Kyong-hee was framed by Sung-chun for a drug charge. She learns of Yong-jun's death and is unable to forgive Myong-ja for remarrying. Upon learning of Sung-chun’s involvement in Yong-jun's death, she leads San-jae to the truth and convinces him to seek revenge for his father. Impressed with Sae-na's talent, she offers her an opportunity to be a singer. Does anyone know where I can get the song sung by Lee Byun Hun in the original OST? I purchased the OST for this drama when it was rebroadcast in our area but that song--I think it was #14 on the track was not there. It is a beautiful song. being my first korean drama, i've only heard of CJW - not LBH. when i first saw him, i wasn't really impressed with his looks and i found the blonde highlights weird. Yeon Soo is my favorite CJW character. she has a strong will. there wasn't really any "girl torn between two men she loves" situation here - she knows who she wants and she'll fight for her love. her weakness is her little sister Sena. omo, i rambled too much i'll finish this later. I remember way back 2003 (Oct I think), I was at our clinic when I first saw BD...I was changing channels looking for something interesting to watch when I saw BD being shown....anyway, I was not really concentrating in watching it....talking to my brother while glancing on the TV once in a while....It was I think almost halfway already...somewhere around ep 11 or 12... then all of a sudden MINCHUL came out! and I was like dumbfounded....embarrassing to say but I was telling my brother is that the lead actor??? Yuk ang panget! (not handsome! )...even my bro agreed with me! shame on me huh! and the hair!!! I said to myself what's with the hair??? it's so yucky! But I don't know... there was something with BD that made me open the TV everyday during the timeslot and watched it... As I continued watching it I was slowly being drawn and mesmerized by MINCHUL!...ooohhh...the stares and that killer smile! and great acting too! When I saw a VCD copy of BD the following month, I grabbed it and did a marathon for 2 days straight! I ate my words already about BH being "panget" ! I am now hook, crazy, addict on BH! haaay! me rambling too much too! I am really a crazy BD/BH fan hence my old USERNAME LBHCrazy! Thank you! Kamsahamida!! I didn't know if I would be successful because I am not very good with technology but I was able to download it. I will enjoy listening to this song! Hi luv dramas! welcome to Beautiful Days! Lee Minchul coming back from abroad and his transformation to "The Crown Prince of the Music Industry". Hi Rubie! looks like we 2 are in a BD mood! Min-chul, weary of the earlier happenings, returns to the company. He is surprised to see Yeon-soo busy at work. Teasing her a little, he makes her a cup of tea. Yeon-soo is deeply touched by Min-chul's sensitive ways. the Kiss over the phone scene ...so cute!!!! Minchul calling Yeonsoo to tell he cannot pick her up for their engagement ceromony...Yeonsoo tells Minchul it's okay and will go with Saena instead and before putting the phone down gave Minchul a kiss over the phone!...just love Minchul's boyish grin! :wub: "kilig"
Yeon-soo arrives at work the following morning, still unable to forget the scene with Sae-na. Min-chul arrives and witness her tears through the glass window, unable to stop himself, he starts to wipe her tears through the window. His actions leaves Yeon-soo in a daze. ^Gigi-hunnie... your BD caps are awesome! 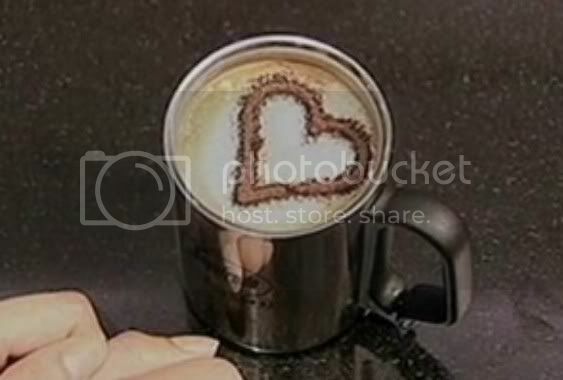 Love the "phone kiss" the best and of course the heart-shaped coffee! Keep 'em coming! The first time they met... accidental??? Fated??? Love coincidental??? Korean drama "Beautiful days" which was shown over Japan NHK station, will be holding a country-wide musical tour in Japan as from 8th March. This is the 2nd Musical concert after "Winter Sonata"... artists who will be appearing will be the Singer from "Heaven" and Zero who sang "Promise". The group band "SENS" will also be performing. Lead actor - Lee Byung hun will be appearing as well thru video. Choi Ji Woo also performed in the "Winter Sonata" Musical concert last year. This time the organizers organised this "Beautiful days Musical Concert" which will be held from 8th March, will be set off from Japan's International conference hall as the starting point and throughout the other places of Japan. "Hallyu" stars Lee Byung-heon and Choi Ji-woo will appear in the final "Beautiful Days" concert in Tokyo, Japan, next month. Japanese dailies including Sankei Sports and Sports Nippon reported April 13 that the two stars will visit Japan to participate in the final concert to be held May 6-7 at the Tokyo International Forum. The Japanese media wrote that while Lee and Choi's visit has been confirmed, the organizers of the concert still have to decide in what manner the two will appear onstage. Apparently, they will greet their fans onstage, and the best scenes of the drama "Beautiful Days" will be shown onscreen. Japanese newspapers are placing high expectations on the concert as it will be the first time Lee and Choi will appear in Japan in public together. The "Beautiful Days" concerts were staged to celebrate the popularity of the same-titled miniseries starring Lee and Choi. "Beautiful Days" gained enormous popularity in Japan when it aired after "Winter Sonata." The concerts have been held eight times between March 8 and April 11 in the Tokyo International Forum and the Festival Hall in Osaka. The final concert featuring Lee and Choi will become a kind of grand finale celebrating the drama's success. "The popularity of drama-related concerts in Japan can be ascribed to the fact that they present audiences with an opportunity to see 'hallyu' stars in person. We are doing our utmost to ensure the success of this concert," said Yedang Entertainment, Choi's agency and the concert's organizer. Lee Byung-hun and Choi Ji-woo are scheduled to appear at the final concert for the drama Beautiful Days, in Tokyo, Japan on May 6 and 7. The concert will be broadcast on NHK. The TV miniseries/drama, Beautiful Days was extremely well received by Japanese fans. Eight other Beautiful Days anniversary concerts have been held since March 8, but this concert is said to be the last. The actors have both had great success in Japan and have held many events and fan meetings separately. However, this will be the first time that the two have come together in Japan to participate in an event. Reports of the two Korean Wave (Hallyu) stars have already been reported throughout Japan and fans are extremely excited about the event. It is not yet confirmed in what manner they appear on stage together. Korean drama "Beautiful days" which was shown over NHK Japan, will be featured in a country-wide musical tour in Japan as from 8th March. This is the 2nd Musical concert after "Winter Sonata"... artists who will be appearing will be the Singer from "Heaven" and Zero who sang "Promise". The group band "SENS" will also be performing. Lead actor - Lee Byung hun will be appearing as well through video. Choi Ji Woo also performed in the "Winter Sonata" Musical concert last year. This time the organizers organized this "Beautiful days Musical Concert" which will be held from 8th March, will be set off from Japan's International conference hall as the starting point and throughout the other places of Japan. here's your fave coffee Rubie! Mischievous Minji getting into trouble... worrying her brother and everyone at home. Can't help but feel sorry for their stepmother who tried so hard to please them... an awkward situation being led to the worst. ^ was it coffee or hot cocoa? i forgot! welcome to the thread YellowStarGirl. unfortunately, there aren't any BD in HQ available in any clubbox as far as i know. i'm not even sure if we'll ever see BD in Clubbox because SBS shows are now on NOWCOM's prohibited list. party poopers! i think they only way you could watch BD for now is to download the Torrent files at d-addicts.